Video clip synopsis – Prime Minister Robert Menzies opens the Lucas Heights nuclear reactor, and marvels at nuclear energy being a relatively new phenomenon in the world. Broadband MP4 energy_bb.mp4 (5.2MB), suitable for iPods and computer downloads. Australia’s First Nuclear Reactor is an excerpt from the film Energy Unlimited (15 mins), produced in 1962. Energy Unlimited: Inside Australia’s first nuclear reactor at Lucas Heights, where scientists from the Australian Atomic Energy Commission 'work to bring the power of the atom into the service of man’. This film records the construction and opening of the centre in 1958 and its ongoing work in atomic research and producing radioactive isotopes for industry and medicine. Energy Unlimited was produced by the Commonwealth Film Unit for the Australian Atomic Energy Commission. Students analyse the impact of some key wars in the twentieth century such as the Cold War. They analyse changes in technology, medicine and communication. At Level 6, students frame research questions and locate relevant resources, including contemporary media and online resources. They identify, comprehend and evaluate a range of primary and secondary sources, including visual sources and use historical conventions such as footnotes and bibliographies to document sources. They critically evaluate sources of evidence for context, information, reliability, completeness, objectivity and bias. 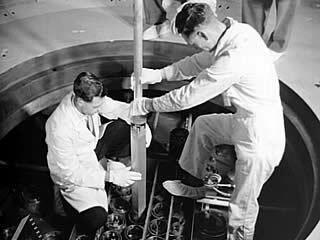 In 1958 Australia opened its first (and only) nuclear reactor at Lucas Heights, a southern suburb of Sydney. The nuclear reactor produces neutrons, subatomic particles found in the nucleus of all atoms, through the process of fission – the splitting of a large atom, such as uranium, into two smaller ones. Fission occurs when a heavy nucleus absorbs a neutron and splits. Neutrons are given off in the process of fission and, after slowing down (losing energy), are used to keep the fission chain reaction going. The Lucas Height reactor was originally built to test materials for their suitability in use in future power reactors. With the decision not to pursue a power reactor program in Australia, there has been a gradual change in how the reactor has been used over the years. The Lucas Heights reactor is one of only 70 reactors worldwide that are capable of producing much-needed medical radioisotopes. It also produces material or carries out analyses for the mining industry, for forensic purposes and for research. The nuclear process produces dangerous waste that must be carefully stored and the Lucas Heights reactor has been named by the government as a potential terrorist target. What is a ‘nuclear reactor’? What image or impression do you get from the video clip about the process involved? What impression do you get from the video clip about the purpose of a nuclear reactor? What image or impression of the purpose of a nuclear reactor does Prime Minister Menzies give in his speech? The video clip was originally titled ‘Energy Unlimited’. What impression or image of the nuclear reactor is given by this title? Recent debate son this issue? Draw a table to record your answers. Australia has one of the largest deposits of uranium in the world. We mine very little of this for environmental and anti-nuclear reasons. Recently there has been a proposal by an internationally respected scientist to increase the use of nuclear power to reduce Greenhouse Gas emissions, which are widely believed to cause global warming. Imagine that you have been asked to help stimulate discussion on the issue of whether Australia should move to nuclear power. Write a letter to the editor of a newspaper raising this issue in a way that will help the debate.